There was no pressure on Burnley to sell striker Sam Vokes to Stoke City. But Sean Dyche hopes the extra finance will be “an extra shot in the arm” for his summer recruitment plans. The Clarets made a profit in the January transfer window, after the deadline day sale of Vokes to Stoke City, for a fee believed to be around £10m. 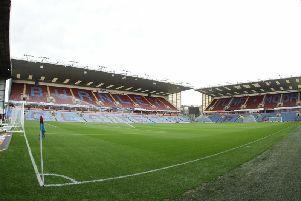 Wolves take 25% of the profit following the £350,000 sale of Vokes to Burnley in the summer of 2012, but Dyche felt the deal was ultimately a good one for all parties. And while the cash won’t make an immediate impact, he feels it can only make the club stronger: “In theory. It doesn’t guarantee the next signing. “At some point the next window opens and you have got to go and activate again, which we will have to do, and it doesn’t guarantee that, but you get an extra shot in the arm to put more into the next situation. “So therefore, if you are in a rising market then you need rising funding. We are at a club that doesn’t get rising funding from people throwing money everywhere, therefore you have got to make rising funding. “You get TV money and then you get what money you can raise. “So it must be helpful in that sense because if the market is going north and you are bringing in more finance then that has got to be helpful. “At the back of my planning has to be what goes on in three months, six months, nine months. It has to be because if not, it will catch us out too quickly. “So pre-planning and forward planning, although a risk and reward strategy, has to be done here. Dyche had money to spend in January, but insists it is an ongoing battle to identify and land players who will fit within the finances of the club: “It is a different model here. Everyone knows that, people put two and two together and say you must have money there because you don’t spend super large amounts, but the club are trying to build beyond year one. “They are trying to build beyond that. It is about 18 months, two years, three years, it is about building a model that be sustained over a long period. “That is why the business side of it is difficult. The business we are in doesn’t care about that, most clubs have got a completely different of view of that and mainly because they have got very, very wealthy owners. “The owners here are very wealthy in my life but in Premier League life, a lot of the owners are worth hundreds and hundreds of millions if not billions, and that is a completely different ball game so therefore the model here is different. “It is tricky here to work with it, you could always want more money like managers do but I have got a balanced view of the realities of the club. “I could jump up and down sometimes and say ‘why aren’t we doing this and why aren’t we doing that?’ But that maybe would put the whole of the club at some form of risk, whereas at the moment everyone knows where it is. “But we understand the challenges, I certainly do, it is difficult because we are always trying to develop players, sign them at the right level and the right age, Crouch is a bit different, but generally speaking. “And within a finance that is achievable now and moving forward. To factor all those things together, and them make the signings happen, is very difficult.